The long rumoured Zeiss Otus 100mm f/1.4 was expected at Photokina last month, but it didn’t officially materialize. A few days ago, Nokishita posted some images of the upcoming lens. This will be the fourth lens in the Otus lineup. The others include the Zeiss Otus 28mm f/1.4, the Zeiss Otus 55mm f/1.4, and the Zeiss Otus 85mm f/1.4 This series of lenses is generally regarded as uncompromised expressions of what Zeiss is capable of. I am curious about the technical data (size and weight) and of course the IQ. I am curious about the price! An arm? A leg? One of each? In Germany this would mean about 5000€. Otus line has unmatched build quality, but optics are matched or, in some cases slightly exceeded by Sigma Art series. Certainly not exceeded in price. No IS, no AF - bad lens ... just kidding! Overall IQ will be stellar, price, weight and size too. from what I guess looking at the photos. And not RF mount either. Yuck. Not going to buy, no kidding. We care what Zeiss will offer to Canon RF. Really? I have all the Otus lenses and used the Sigma art series . They don't even compare when it comes to color, micro contrast and sharpness! Without objective measurements it is difficult to distinguish resolution differences between two lens that are both extremely sharp. 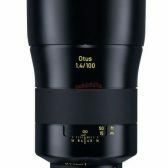 But check out the lenstip review site and compare the Otus 85mm with the 85mm Art. Very comparable resolution with a slight edge going to the Art lens. Again, this is not anything you would see when using either lens, but you certainly would see the price difference when purchasing. The edge in color and micro contrast does go to the Otus, but not big differences there either. What's the point of releasing a 100mm f/1.4 otus when there is already an 85mm f/1.4 otus? At 100mm and f/1.4 the depth of field is so shallow that you basically have to "fix" your model (e.g. make it lean with her head against the wall) as the lens does not have autofocus. Many reviews said that hitting the focus is the biggest problem of the 85mm f/1.4. IF you hit it, you get the best image quality possible, but that is a big "if". Expecially if you use that lens of a DSLR which does not have the ability to show you which areas of the photo are in focus. For those lenses you need a camera that automatically takes the shot once the eyes are in focus. I don't even need f/1.4. I'd like 50/1.8 or 35/2, that sticks out no further than the front of the grip. Any shorter than that doesn't make the camera as a whole shallower, so a pancake doesn't have much appeal to me. Meanwhile, an f/2.8 pancake is useless if you decide to bring f/2.8 zooms with you. In contrast, a 35/2 or 50/1.8 would still go in the lens bag even if you were carrying the trinity zooms. The 35/1.8IS Mac isn't small enough. And I'd be happy to do without the IS and macro to have something smaller. Sure, 50/1.4 is very nice, but I wonder what middle ground there is between making it huge and super-sharp (like the RF 50/1.2 or the Otus 55/1.4) and tiny but kind of sucky (like the EF 50/1.8s and 1.4s). Leica shows that when you don't have to contend with a mirror, a 50/2 or 50/1.4 can be both small AND sharp. Many reviews said that hitting the focus is the biggest problem of the 85mm f/1.4. IF you hit it, you get the best image quality possible, but that is a big "if". I'm not positive, but I think with Focus Peaking and EVF magnify, we might be good enough. Steady model. Manual focus until eyes flash red then snap. It'd be nice if they combined pupil detection with a "trap focus shutter." Press the shutter button and as soon as it detects sharp pupils it takes the shot. I would posit that while the Sigma may slightly edge the Otus 85mm f1.4 in resolving (it is a much newer lens), and while it is a very good lens (especially for the price) it's overall rendering (total imaging 'prowess', if you will) will not match the Otus (for reasons already mentioned by another Poster). Although that rendering/'look' comes at a steep price premium. The real problem with the Otus line is that it doesn't take advantage of the fact that the rear element can be far closer to the R's sensor than on an EF camera. I'm guessing at 135mm that doesn't matter, but I also guess that at 85mm it does. Not sure about 100/1.4. BTW, focus on 72mm aperture lenses should be about the same difficulty throughout the range: 85/1.2, 100/1.4, 135/2, 200/2.8 are all 72mm aperture and will have precisely the same DOF wide-open for a given subject distance.